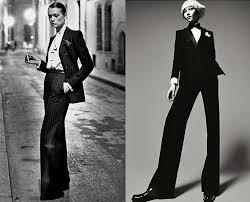 Did you know that in our past, women wearing pants were refused entry to formal establishments until the 1920s? How things have changed in the last one hundred years. Walk down any city street today, and you will see more women wearing pants or jeans than skirts. In the late nineteenth century, the legendary French actress Sarah Bernhardt daringly wore pants on stage. From there, women who were enthusiasts of bike riding wore pants for practical reasons. 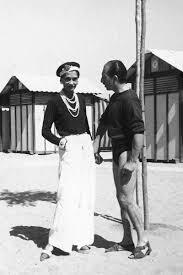 Coco Chanel introduced elegant sailor pants in 1910 at the society beach resort of Deauville, at first designed for herself and then for other women who admired her style. Moving forward twenty years, famous bisexual movie star Marlene Dietrich, who was often referred to as "the best-dressed man in Hollywood”, caused a scandal by wearing pants as daywear in the 1930s and ’40s. She was ordered to leave the city of Paris by the chief of police who considered her attire too shocking. It wasn’t until World War II that it became acceptable for women to wear pants for wartime work in the fields and factories in the absence of the men. But in 1945 when peace resumed, women went back to wearing dresses and skirts as they viewed pants as unattractive. However, women still wore shorts and Capri pants as leisurewear. Women didn’t really start to embrace the comfort and practicality of pants until the swinging sixties, where they began to wear pants to work, dinner and parties. But this was still shock value to some, and we again saw women being refused entry to formal establishments, and even restaurants. It was the year 1966 when fashion designer Yves Saint Laurent designed a sleek tailored pantsuit, famously known as Le Smoking. The suit was controversial at first, but eventually received the seal of acceptability as an alternative to the skirt or dress. The suit was formal and elegant for women and finally acceptable to all. Women could eventually wear the pants and receive the respect they deserved. Fast forward to now and see how gorgeous Violet (Instagram), a beautiful and stylish woman in her 50s with 5 children, styling Cazinc The Label’s Brown 100% Italian Wool Blazer, Cigarette Pants and White Asymmetrical Long 100% cotton shirt. Dec 2 Who Wears A Formal Suit Well?